This contest is open to 2A-5A (OSSAA) classified groups and is designed to provide an OBA-like experience for students, parents and staff. 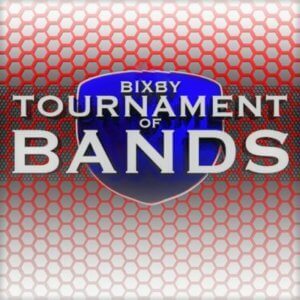 OBA judging format-Top 12 in finals-Caption awards-Critique for all groups-Lighted warm-up areas-Field Turf-Concessions that accepts ( Credit/Debit via PayPal) and merchandise-Pride of Bixby exhibition performance. Contact Jeremy Parker for more information. Parking: Event Spectators located in the Main school parking lot or across the street from the stadium. BTOB Student and Adult Volunteers please park at Central Elementary. L. Dale Barnett is the retired director of bands and instrumental music supervisor at Union High School in Tulsa, Ok. He re-started his teaching career as director of bands at Holland Hall in 2007. Mr. Barnett earned his Bachelor of Music Education degree from Oral Roberts University in 1971 and then earned his Masters of Music Performance degree for the University of Tulsa in 1982.Mr. Barnett is currently a member of the Oklahoma Music Educators Association, the Oklahoma Adjudicators Association, Oklahoma Bandmasters Association of which he is past president and the American Federation of Musicians. He has been nominated to the Who’s Who of American Teachers and has worked as a freelance trombonist in the Tulsa market for 42 years performing with such artists as Wayne Newton, Liberace, Dionne Warwick, Mel Torme’, Ella Fitzgerald, Suzanne Summers, Pete Fountain, Doc Severinson, Dave Brubeck, and many others. Mr. Barnett was also the Principal Trombonist in the Tulsa Philharmonic for 15 years from 1971 until 1985 playing under conductors such as Franco Autori, Skitch Henderson, Murray Sidlin, Tom Lewis, Joel Lazar, Peter Nero and Bernard Rubenstein. He began playing with the Gilbert and Sullivan Society’s musical series at its’ inception. (1977 ) and also began playing in the summer series of Starlight Band concerts upon graduation from Oral Roberts University in 1971 and in 2000 was chosen as the music director and president of this local ensemble. He began playing with Signature Symphony on a part time basis in 1997 and is currently a full service player on bass trombone and the personnel manager of this ensemble. Mr. Barnett judges marching bands throughout the Midwest in both visual and music captions and is the contest director for all of the Oklahoma Bandmaster Association Marching Band championships in class A through 6A. Dr. Allen Correll recently retired as Associate Professor and Director of Bands from East Central University. He taught courses in conducting, applied trumpet, wind band literature, instrumental methods and served as Director of Bands from 2003-2018.Dr. Correll earned a DMA in conducting from OU where he graduated with honors in 2009 and was awarded the outstanding dissertation prize in humanities that same year. He has delivered several lectures on Percy Grainger including presentations at Kansas State University, the 2017 National Symposium on the History of Music Education and the University of Melbourne in Australia. Dr. Correll is also a contributing author to Grainger the Modernist published in 2016. He was awarded OBA Band Director of the Year in 1992, and served as OMEA Band Vice-President and OBA President in 1993. Dr. Correll is internationally recognized as a Sudler Flag of Honor recipient. The Sudler Flag of Honor Award was presented to the Westmoore High School band program in 1997 which recognizes outstanding high school wind band programs internationally and throughout the US. Dr. Correll was awarded the Governor’s Commendation and National Band Association’s Citation for Excellence in 1998 and was inducted into the OBA Hall of Fame in 2005. Brent Rowland, a 35-year pageantry veteran, began performing with OBA champion and BOA national finalist Union High School, continued with DCI finalists the 27th Lancers, and taught and designed for championship drum lines, top-ranking color guards, and marching bands including OBA champions and BOA national finalists Union and Broken Arrow. A Winter Guard International judge since 2009, he has judged in a dozen circuits and states, including California, Colorado, Florida, Indiana, Ohio, and Texas. Professionally, Brent is an attorney and educator, past teacher of the year for Broken Arrow Public Schools, and currently principal at Grissom Elementary in Tulsa. Ron Lewis is currently working with the Van Buren, Arkansas instrumental music program, where he teaches 6th through 12th grade students. Ron has taught at Salina, Muldrow, McAlester, Bartlesville, and Collinsville in Oklahoma where his bands have consistently placed high in competition and won several caption awards throughout the years. Ron is a very active judge and clinician in both marching and concert and has worked in Arkansas, Kansas, Missouri, Oklahoma, and Texas. Ron’s wife Gina, is the colorguard instructor for the Van Buren High School marching band, and has worked with him for 30 years. Sam is and Okmulgee H.S. and University of Oklahoma graduate. He has been a head middle school/ junior high and assistant high school Band Director, color guard/winter guard designer, instructor, director and consultant/clinician in the Midwest and Southwest United States for 30 years. He has taken several different high schools to BOA Regionals, Super Regionals, and WGI Regional Finals. He has taught at Westmoore H.S. Union H.S., Brazoswood H.S. ( Texas), Winston Churchill H.S. (Texas), J.J. Pierce H.S. and Allen H.S. He is currently an Assistant Band Director and Color Guard Director at Smithson H.S. in Spring Branch Texas. Aaron J. Morton is the creative director at Zephyrus Arts Institute and the lead designer at the Pride of Bixby marching band. His work as a designer, choreographer, and composer reach international audiences in the world of pageantry, film, and digital entertainment. Bixby Bands Directors, Staff and The Pride of Bixby Marching Band would like to Thank its 2018 Sponsors for their dedicated support.